My sisters like to abbreviate. Katelyn once referenced the pocket to her jeans as a p-ock, insigating running joke among the five of us. I believe she also coined the term “T-givs” to save time from having to utter the three syllables of the word “Thanksgiving.” But I guess it is a long word. I have a few other friends who use this phrase. My mom even named her Thankgiving Facebook album “T-givs 2010.” To each his own. I was not merely worried about my first Thanksgiving not eating meat. I ended up just as stuffed as any other year; perhaps more so. There is always an abundance of vegetables so it definitely wasn’t an issue. After Thanksgiving one year, my grandmother sent an email around asking us to vote for our two favorite vegetables because I think we ended up with something like 10 or 12 veggie dishes. Not that that was a bad thing, we just had too much food, even for 25-30 people. I love Thanksgiving. A lot. I always have. But it’s not necessarily the institution of Thanksgiving “dinner” (quotes because we eat at 2pm and are all in food comas by the time 4pm rolls around. I was ready to call it a night around 6:30pm this year) that gets me going. It’s really the preparation for the day that I love so much. 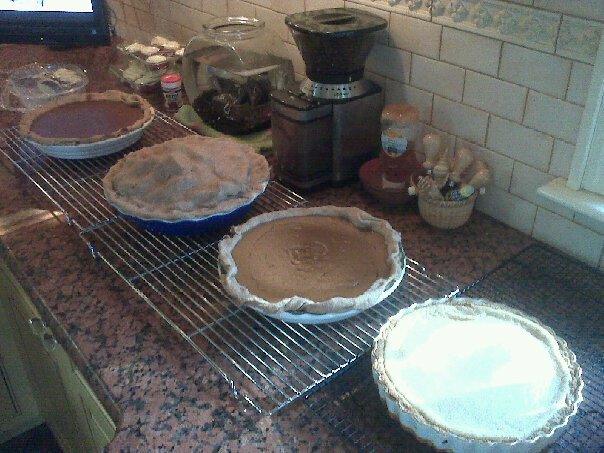 For as long as I can remember, my family has been in charge of making the desserts for Thanksgiving. Many eons ago, we made one apple pie, one pumpkin pie, and one pecan pie. As evolution would have it, we are now up to making five or six pies each year. Somewhere in my 22.75ish years on this earth, the reigns were handed down to me and I became virtually in charge of doing all the holiday baking (including zillions of Christmas cookies). I cannot really say where this passion for baking during the holidays started, but I imagine it was somewhere around the time that I was at boarding school and not around for the entirety of holiday prep. Or maybe it was that I wasn’t there for the anticipation of the holiday prep and therefore pined away for it. Luckily, I was able to make it back to Jersey for Thanksgiving Eve day, infamously known as Pie Day in our household and to those closest to us. The select non-family and non-immediate family members who have been lucky enough to be present for some part of the holiday baking extravaganzas inherently know the following about pie day: the entire kitchen is in a haze of flour all day; the whole house is 40 degrees warmer than it should be because of the constant heat from two ovens and a stove; and pinwheels never make it out the door to Thanksgiving dinner and no one cares. This year we made two pumpkin pies, an apple pie, a chocolate cream pie, a key-lime pie, pecan tarts, and pinwheels that had quite mysteriously obviously disappeared a substantial 24-hours before Thanksgiving dinner. Pumpkin, apple, pumpkin, key lime. Yum-o. Sidenote: Pie is a suitable meal for breakfast, lunch, dinner, brunch, linner, or a snack. I had my pumpkin pies after every meal for the rest of the weekend. Now that’s what I like to call leftovers.